This app brings the best of NEEO and Homey together. Controll every device or flow in Homey with the NEEO remote. Use sliders, buttons and switches to build your own virtual device and use the Homey flow editor to hook it up to all kinds of Homey apps. The app supports feedback of information as well. Change the volume of your receiver and the slider on your remote will change in realtime. Want to visualise your sensors or "what did homey say? ", with this app you can inform the remote about all kinds of state changes including textual. So what did homey say? you can see that on your remote. Build virtual devices and make them availeble to NEEO. Controll Homey Flows with your NEEO remote and controll your NEEO connected devices with Homey. Please note that this is not an official NEEO app made by NEEO and there will be no support from NEEO concerning this App. Create virtual devices and make them available to NEEO. Add buttons to your virtual devices. Add sliders to your virtual devices. Add switches to your virtual devices. Add textlabels to your virtual devices. Add images to your virtual devices. Add predefined media buttons to your virtual devices. Add predefined digit buttons to your virtual devices. Add predefined power buttons to your virtual devices. Add predefined navigation buttons to your virtual devices. Added virtual devices contain a default set of buttons. "A button is pressed." This card is triggered when a button of a virtual device is pressed. "A switch changed state." This card is triggered when a switch of a virtual device has changed state. "A slider is changed." This card is triggered when a slider of a virtual device is changed. "Recipe is|isn't active." This card will condition a recipe being active or deactive. "Activate a recipe." This card will start (Activate) the selected recipe. "Shutdown a recipe." This card will shutdown (deactivate) the selected recipe. "Shutdown all recipes." This card will shutdown all recipes. "Press a button." This card will press the selected button on the NEEO remote. "Change a Switch." This card will set the selected switch on the NEEO remote to On/Off. "Change a Slider." This card will set the selected slider on the NEEO remote to a specific value. "Inform slider state. (Percentage)" This card will inform the NEEO remote user interface of the given value in percentage for the selected virtual device slider. "Inform slider state. (Value)" This card will inform the NEEO remote user interface of the new value for the selected virtual device slider. "Inform switch state." This card will inform the NEEO remote user interface of the new value for the selected virtual device switch. "Inform label or image state." This card will inform the NEEO remote user interface of the new value for the selected virtual device label or set the image based on a URL or image tag. Adding feature to check specific sensor values in NEEO. Adding a tool to debug/test ir commands. setting brain's as seperate devices to Homey. removed depricated buttons 'SKIP BACKWARD' and 'SKIP FORWARD' for new virtual devices. Included "specificname" SDK feature. New virtual devices won't be added as MEDIA or GAME but with their specific name. bug fix, A copy past one. Re added a delete virtual device feature to the app settings. thanks for reporting Chris Sesier! Minor change to the offline brain icon. now has no status led. Minor change to the image icon. Fixed NEEO Events. should work again. Less logging for event registers. Fixed settings information button, Wrong Icon removed. Show device icon in settings device view. Fixed some typo's thanks to Mark Swift. 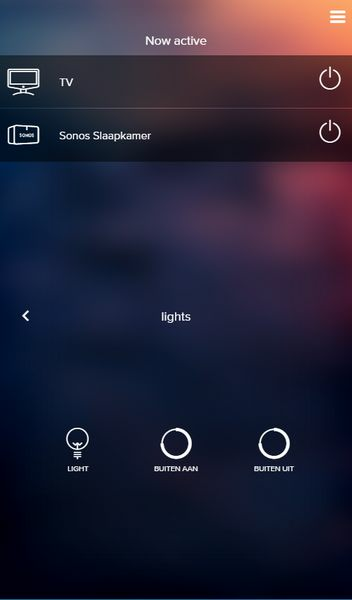 Fixed device naming in Homey settings. thanks to Mark Swift. Detect when a brain is unreachable. Detect when a brain is reachable again. Only register homey as NEEO device database when needed. Only register forward events when needed. Fixed a bug where discovered data was not properly saved. Changed to HTTPmin node package for better promise handling. This has been a huge change and issues are to be expected. Settings page now show more system information details. Support base64 images (image Tag) to NEEO. just drag a image tag in the "Update textlabel or image state." card. Fixed an issue that would happen when searching a device in NEEO when no virtual devices where pressent on Homey. Fixed an issue that would happen when searching capabilities in Homey when no virtual devices where pressent. Fixed an issue that would happen when getting all devices in Homey when no virtual devices where pressent. Fixed an issue that could happen while retreving brain configuration. Fixed an issue where selecting a button would crash the app. Fixed an issue where the app would crash when no NEEO brains where found. Added …And… card recipe is active/deactive. Added …then card blink NEEO Brain LED. Neeo now support images! and so does this app. Fixed first time use issues. Fixed the use of percentage values. (0 to 1). A lot of smaller bug fixes. Fixed an issue with a corupted neeobrains save. Fixed an issue when NEEO requests a unknown capability. Fixed a critical bug that rendered all NEEO flows unusable. Added textlabel icon for app settings. Changed initial bonjour interval from unlimited every 10 seconds to 10 times 1 minute. Default capabilities will now be added when adding a new virtual device. Settings page look and feel changed. Added a download configuration button so you can make a backup. Added setting to view connected NEEO brains. Added discovery button to manually discover NEEO brains. Added a delete NEEO brain function to settings. Fixed a bug where switches didn't work. Changed name of "drivers" to "Virtual Devices"
Fixed a bug that causes bonjour error's. Added a way to turn off all active recipies. Changed re registering to rediscovery/reconnect syclus of 10 Minutes. What is your impression so far on the NEOO? NEEO and Homey strengthen each other really well. off-topic:cYou got it 2 weeks ago? Cool, I didn't know they were shipping..
@nklerk Were you a super early bird? and did you have to pay any taxes? I'm currently the only backer with a neeo as far as I know. I got a pre-production NEEO as a special thanks at a backers event in Amsterdam after the ISE2017 trade show. They are about to start mass production soon. Good to know that there are more people with a NEEO! In one of my posts I said that as soon as i've received my NEEO, I would try and combine the power of both devices. Well two weeks ago I received my NEEO. Currently all my interactions between NEEO and HOMEY are made with the "HTTP request" app. and the NEEO's ability to forward all actions in json format to an IP. so i forward all events from NEEO to Homey. I haven't made an app yet but i intend to build one for NEEO and one for Homey. I have to see how that works out as my first real experience with JS is from this weekend. lol. Homey reageert op de zender keuze. I hope my neeo comes this week, wait so long. How is the quality? I wouldn't bet on receiving your neeo this week or the next. I just read that next sunday there will be an update. hopefully well know more on the KS units. Yeah my first app! and it's working. its a really simple app. But does the job. with the videos earlier I needed to have the NEEO output sent to a perl script and then too homey http app. Now I just need my app and it works native. Please load this to the app store, hope i get my neeo to in near future. Why you get your neeo? For being very supportive, and very active on the KS comments. And with an app even I could get it to work! The remote doesn't do much without a brain. The reason you can buy a remote separate is that you can use multiple remotes. was afraid of that. tought to spare a few euros. But thank u for ur quick response. You can use a brain only setup, where you use the app together with the brain. Thing is It's the remote together with the brain that makes it such a great product. I know its hard to wait, but o man its so worth it. I was wondering if you guys are missing features, want to see stuff differently or if there are any problems you run in to. These can be used to automate other actions.